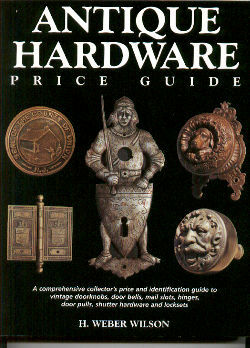 A comprehensive collector's price and identification guide to vintage doorknobs, door bells, mail slots, hinges, door pulls, shutter hardware and locksets. Special Price of only $10 with shipping only $2.50 to anywhere in the US. Signed by the Author, Web Wilson . Purchase this book securely at PayPal. A thorough and concise study of American architectural glass. Topics include glass history, American fenestration, leaded glass, beveled glass, etched glass, and much more. Heavily illustrated. 42 pages, paperbound. $15 postpaid.